MONTHLY SUBSCRIPTION: Your credit card will be charged today in the amount noted above and charged automatically each following month for a 12-month period. After that, your subscription will be renewed automatically on a month-to-month basis and you can cancel at any time. However, you must cancel your subscription in writing and in advance of your next payment if you do not wish to continue to subscribe. ANNUAL SUBSCRIPTION: For additional savings, you can choose to pay for the next 12 months all up front. Your credit card will be charged today for $799 $499 and your subscription will automatically renew each year. You can cancel your automatic renewal at any time up to one year from the date of your subscription. Newest Developments as They Occur? As the New Tax Reform is further digested and analyzed by top experts, and new guidance is issued by the IRS, Congress and courts, will you be able to keep up and provide the best possible timely advice to your clients? This is why we enlisted the help of nationally renowned CPA and tax planning expert, Robert S. Keebler, CPA/PFS, MST, AEP (Distinguished), CGMA. 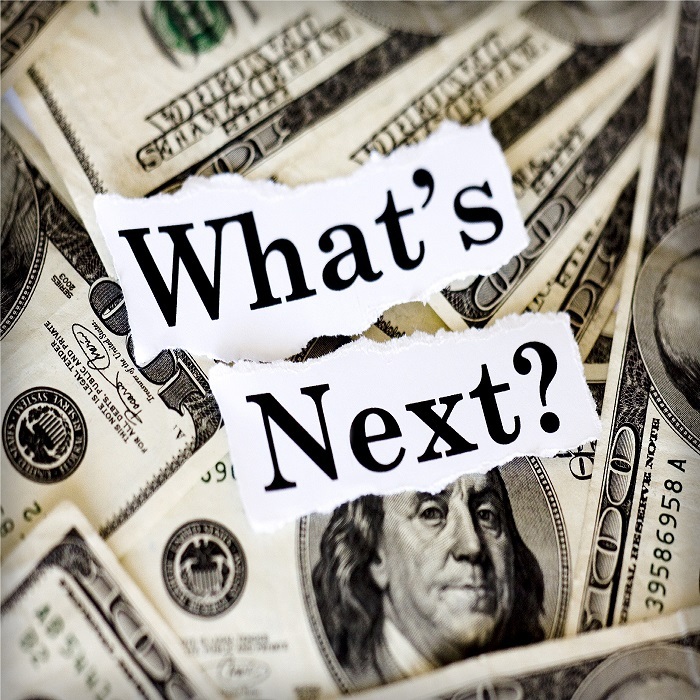 In the past, Bob put together a monthly teleconference, where he consolidated the latest important cases, rulings, and tax and estate planning changes, along with the planning strategies that result from these changes. But, we found that busy professionals like you couldn’t always attend the live calls or even find the time to listen to the recordings. So, we’ve made it even simpler and more convenient for you! 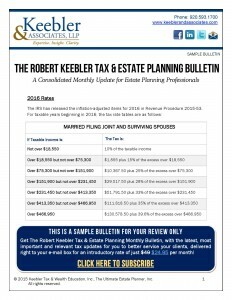 Bob and his team of experts at Keebler & Associates have agreed to put together a practical, “what you need to know” written bulletin, delivered to your e-mail inbox, for you to quickly review at your convenience. Why spend countless hours of your own time and energy to stay on top of all of the changes coming to the tax, financial, and estate planning world following the Tax Reform when you can have an expert do it for you? Whether you’re an estate planning attorney, CPA, financial advisor or life insurance agent, you better be on top of it and be the first to advise your clients—or someone else will! Click the “Details” tab for more information about available subscription options and to view a sample bulletin. Each month, you will receive a Monthly Bulletin of anywhere from 5 to 8 pages (or more), chock full of important updates and invaluable content. There are some things you can’t get in audio format, such as charts and other diagrams. This monthly bulletin will help you avoid having to sift through all of the different IRS rulings, court cases, tax law changes, etc. each month. You can now have Bob and his team consolidate this information and provide you any pertinent planning strategies that you may be able to use for your clients. For your convenience, you can choose from either a monthly or annual subscription. 12-MONTH SUBSCRIPTION: Your credit card will be charged today and charged automatically each following month for a 12-month period. After that, your subscription will be renewed automatically on a month-to-month basis and you can cancel at any time. However, you must cancel your subscription in writing (by sending an e-mail to us at orders@ultimateestateplanner.com) and in advance of your next payment if you do not wish to continue to subscribe. ANNUAL SUBSCRIPTION: For additional savings, you can choose to pay for the next 12 months all up front. Your credit card will be charged today for the full amount. Your subscription will automatically renew at the end of the 12 months for the following year, at which time your credit card will again be charged for the full amount. You can cancel your automatic renewal at any time up to the end of each 12-month period. For monthly subscriptions, once you have subscribed for 12 months, your subscription moves to a month-to-month commitment and you can cancel your subscription at any time. For annual subscriptions, you can cancel your automatic annual renewal at any time. 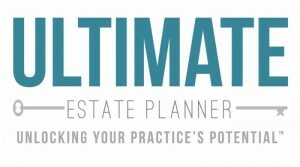 To cancel your subscription, send an e-mail to orders@ultimateestateplanner.com. Due to the nature of this product, no credits or refunds will be provided. NOTE: The Ultimate Estate Planner, Inc. will do its best to accommodate any special requests from customers to assist with the successful delivery of the monthly updates. However, due to the various e-mail security settings of our customers, there may be delay or failure to receive e-mails from The Ultimate Estate Planner, Inc. in a timely fashion. It is not the responsibility of The Ultimate Estate Planner, Inc. to ensure receipt of e-mailed content. Failure to receive e-mails due to the customer’s e-mail security settings does not warrant a refund.